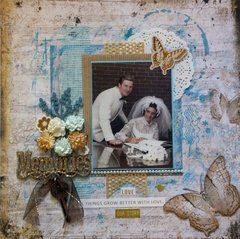 If you love the Tim Holtz color of the month releases then you will love having these beautiful colors all in one place. 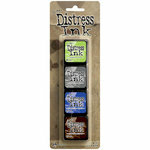 These dye ink pads are acid-free, non-toxic, fade-resistant and water-based. Perfectly designed with a higher raised felt for easier use with direct-to-paper techniques. 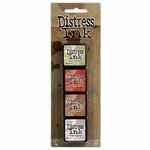 Each of the four ink pads measure 1.25" x 1.25" and are perfect for layouts, cards, photo aging, weathering projects, fibers and more! Re-inkers are available in .5 oz. amber glass bottles with eye-drop applicators (sold separately). 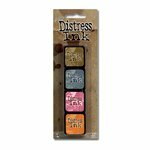 The four shades that are included in the package are Cracked Pistachio, Abandoned Coral, Mermaid Lagoon, and Fossilized Amber. The mini ink pads are my favorite and I love the new colors. The Cracked Pistachio is the prefect mint, which is hard to find. I also love the Abandoned Coral and the Mermaid Lagoon. 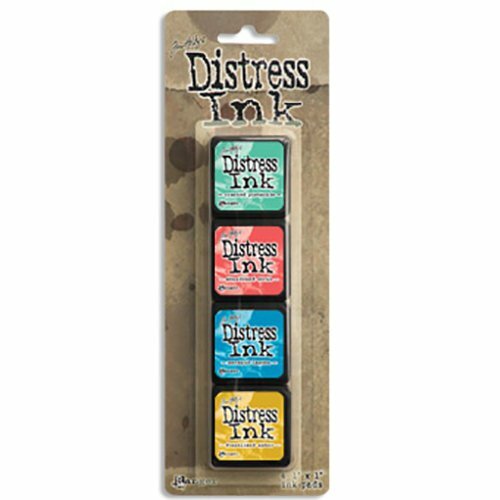 You can't beat Distress Inks for techniques and I'm thrilled to have the first mini kit with the new colors for 2015. 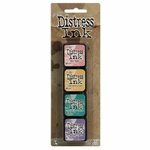 This is the perfect combo distress minis for my spring and summer craft projects. The size is 1x1 inches. They came with a well loaded ink pad. The lids are tight the first time you try to open them (I had to pry one off with a paper piercer), but they get easier with use. Tim Holtz said Ranger received complaints of the lids falling off the previous minis, so they had to tighten them. That's why you'll find they are a little harder to deal with. 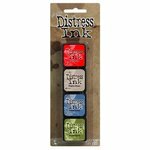 Other than that, the ink pads were all the same kinds of wonderful that Tim's distress pads always are! 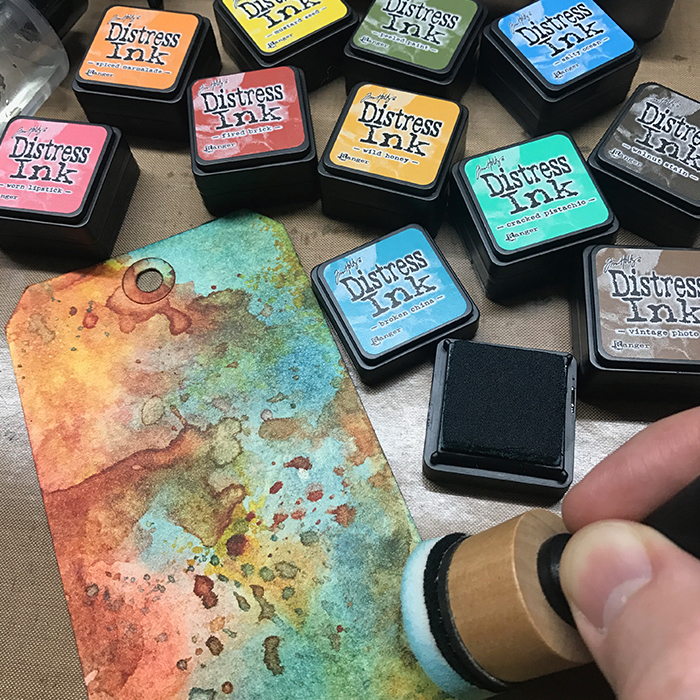 Love the size, colors and the many uses for these Inks! I only ordered one of these because I wanted to try them out before I bought a set. I watched several tutorials before I purchased. I have dabbled in watercolor prior to ordering, but that and the tutorials and the beautiful colors are what got me to try this brand. They are awesome, so I bought the remaining colors from another vendor at a much lower price. 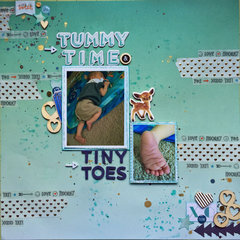 If scrapbook.com had a price matching feature, I would have bought them here. 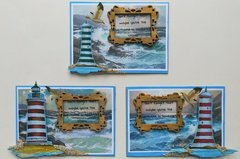 The Distress Inks a fun to play with, when I master these I look forward to creating a set of the Oxide Inks. I am loving learning with these AWESOME inks that work for waterfcolor! Purchased these and set 14 to add to my collection of minis. 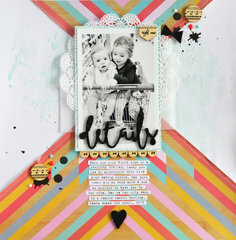 I love Tim Holz's products. More good colors I didn't have. You have watch the video to understand how to use these. They are NOT like regular stamping inks. brushed corduroy,chipped sapphire, aged mahogany, & pine needle. U are showing KIT #12 with completely different colors, i am so very confused. Sincerely By: darlin1937 (04-Jan-16) Helpful Question? Yes | No Thank you! Report Inappropriate This question has been reported. Thank you! 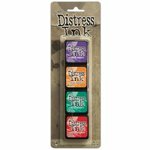 what you have is kit 12, if you do a search on here for Tim Holtz distress ink pads Mini kit you will see all of them and the 4 colors in each kit. Kits 13, 14, and 15 are the 12 colors he released in 2015. HTH! By: Claudia29again (04-Jan-16) Helpful Answer? Yes | No Thank you! Report Inappropriate This Answer has been reported. Thank you! these 2 items are back 'in stock"???? I hope i am clear on this question??? Sincerely By: darlin1937 (04-Jan-16) Helpful Answer? Yes | No Thank you! Report Inappropriate This Answer has been reported. Thank you!